Jake Coleman was born in 1996 and has been racing Go-Karts since he was 8 years old. He has attained numerous achievements in his young career and is recognised by many in the sport of Go-Karting as dedicated, professional and talented and is highly respected for his support of others in karting. Jake has competed in over 10 State Titles and has had several podium finishes. In 2008 he was the Australasian Gold Cup Champion, The Eastern Creek Champion for Rookies and the Junior Club Champion for Lithgow. In 2009 he placed 2nd in the NSW State Championships. Also in 2009, Jake notably competed in the Rotax Championships for the first time where he was one of the youngest drivers ever to particpate in the race and where he finished an impressive 14th overall after being bumped off the track earlier in the race. More recently, Jake placed 2nd in the finals of the 2011 CIK Stars of Karting, KF3 Rnd 3. 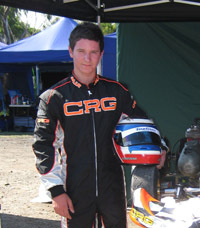 He is also the CRG Factory Driver where he tests Go Karts for the Future of Racing. Jake has a fun, relaxed attitude with an unwavering focus which is paramount when it comes to preparation, development and fine tuning of his racing. Having already achieved multiple successes in Karting, Jake has tested in a Formula Ford, with an eye to securing a full-time drive in the premier Junior Development category in the not too distant future.